Real Flavor - We use only 100% real food ingredients for irresistible flavor and scent. We fuse 100% USA-sourced REAL BACON all the way through the chew. Dogs can tell the difference. Made in the USA - We are fully committed to Made in USA, including packaging, tooling, and all material and ingredient sourcing. We proudly manufacture our products in New York. Let’s be honest, owning a dog is awesome. They are loyal, they will protect you, and regardless of what is going on in your life, they will always be happy to see you. The bond that mankind has with dogs is something that has existed for thousands of years. Scientists have clearly shown that dogs make us happier, make us more active, minimize our chances of depression, and overall improve our quality of life. For all that your dog does for you, it only seems fair that you would want to do something back for them. With that in mind, we have compiled a list of the best chew toys you will find online. We rank this as our gold product for many reasons. First and foremost, this chew toy tastes like bacon. As much as we as humans love bacon, our dogs love it more. 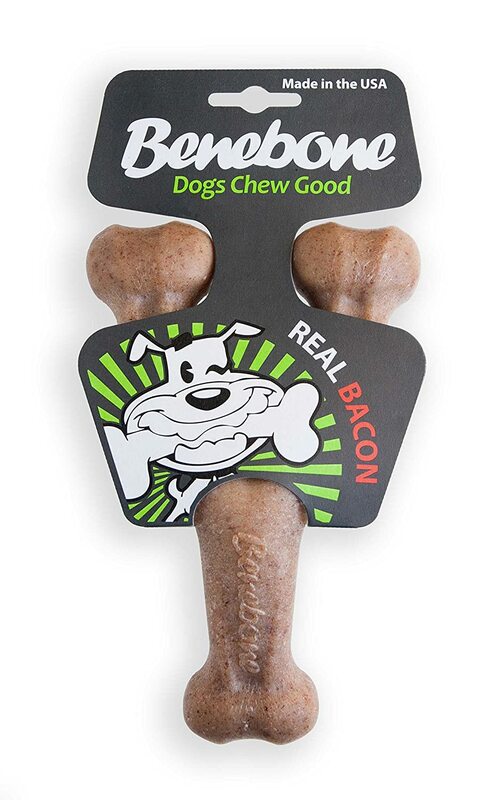 The Benebone has been designed to have a realistic bacon flavor that your dog can enjoy for hours at a time. As your dog chews on the Benebone, you will notice that it becomes scratchy. This may happen as soon as the first day. Do not get alarmed. This is exactly what the bone is designed to do. It has a flavor that your dog loves, and so your dog is going to be chewing on it for a long time. The light scratches that are produced actually help your dog clean its teeth and shape its teeth. The more your dog chews on this and other chew toys, the less often he or she will need to have their teeth cleaned. For this reason, when you look at the Benebone, you’ll see that it has a curved shape, which is designed to let your dog chew on all three of the nubs. Benebone prides themselves on the level of natural ingredients they include in this chew toy. Since natural ingredients are used, you may notice a variation in the color of the product one from another. Although Benebone is adamant about using a consistent amount of ingredients, the natural nature of the ingredients sometimes results in a variation in color. When you hear the term ergonomic design, you usually do not think about something that is made for dogs. However, the unique curved shape has been ergonomically designed to allow your dog to have good access to the ends of the toy and to enjoy a satisfying chew. And the ergonomic design must be paying off because multiple reviewers on Amazon say that their dogs loved the product. They said if they have multiple dogs and their dogs can only find one chew toy, a minor war breaks out between the dogs as they all fight for the same Benebone chew toy. As a dog owner, you are going to love this chew toy almost as much is your dog does. In addition to watching your dog enjoy chewing on it for hours on end, you’re going to appreciate the fact that although the chew toy smells wonderful to your dog, you personally will not be able to smell it at all. There may be an initial bacon smell when you first take it out of the packaging, but that smell will diminish quickly. 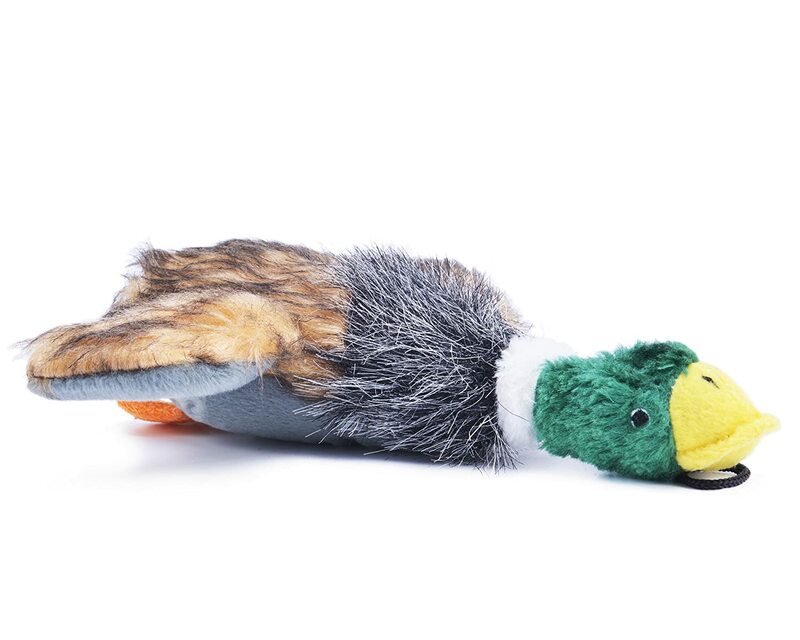 Something else that you are going to love about this dog chew toy is that even if your dog goes to town on it for hours at a time on your carpet, it does not leave any residue. The dog has fun and you have nothing to clean up. Another great feature of the Benebone chew toy is that it is entertaining enough to keep high-spirited dogs relaxed and entertained. Many pet owners commented on Amazon that dog breeds with low energy will chew on the chew toy for a while. However, those that have high energy seem to be entertained by the toy for hours on end. This makes it a perfect toy to give your high energy dog if you need to crate them for a period of time. The Benebone chew toy is made in the shape of a wishbone. It is a hefty bone that can be enjoyed by smaller or larger dogs. Its dimensions are 7 inches long, 1.5 inches thick, and 4.8 inches wide at its widest point. The product weighs 5.6 ounces. The Benebone is made in the United States. The packaging is recyclable, and 1% of the proceeds from the purchase of the Benebone goes to canine related charities. Reviewers on Amazon were overwhelmingly favorable of this product. There were more than 1,900 reviews, and they gave the product at overwhelmingly high 4.4 out of five stars. The Benebone is a long-lasting chew toy that will keep your dog interested for hours on end. It will keep them happy, it will keep them excited, it will improve their overall health, and this bacon flavored toy will make your dog’s life better. We rated the Nylabone Dura Chew our silver product because thinking from a dog’s perspective and the perspective of many dog owners, peanut butter is second only to bacon in flavor. Of course, the flavor of the chew toy was not enough to earn it its silver rating. One of the other factors that we took into consideration was its ability to protect your dog’s teeth and to control plaque and tartar. The chew toy is designed with raised bristles that will clean your dog’s teeth as they chew on it. The more they chew, the better their teeth and their breath will be. Another benefit of this product is that it helps your dog control or resist destructive chewing habits. Dogs are chewers by nature. If they do not have a product that they enjoy to chew on, they are going to release their stress by chewing on things that are valuable to you, like your shoes, pillows, and socks. The desire to chew is something that dogs have from the time when they are puppies and will have all the way until they are adults. The Nylabone Dura Chew has had the peanut butter flavor infused all the way throughout the product. As a result, your dog is going to be engaged in chewing on the product for an extended period of time. A nice thing about the chew toys that Nylabone produces is that they come in different levels of chewability. So if you have a large Rottweiler, you will need to pick a chew toy that is a little bit more sturdy. However, if you have a small Chihuahua, you will want to get a chew toy that is a little bit less resistant. Something that you as a pet owner should remember is that this product is not designed to be edible. It’s a chew toy, and so when you see it start to wear down to the point where little pieces are breaking off, it may be time for you to purchase a new one. The Nylabone chew toy has been designed to not stain your carpet. So your dog can go to town on it for hours on end, and it’s not going to get sticky, it’s not going to get runny, and it will stay solid. As it starts to get to the end of its useful life, you may notice small pieces of the product on your carpet, but these can be easily cleaned up. 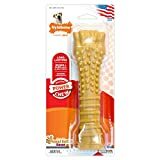 The Nylabone has had more than 1,500 customer reviews on Amazon, and it has walked away with an impressive 4.4 out of five stars. This is due in part to the fact that the product is made from a nylon that can resist even powerful chewers. Reviewer after reviewer talked about how their aggressive chewing dog has enjoyed chewing on their Nylabone for months on end. 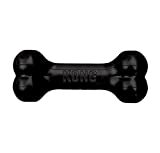 Review after review showed that dogs love the KONG Extreme Goodie Bone Dog Toy. It has a unique design that allows you as the pet owner to select a treat that your dog will like, then put the treat into the chew toy, and allow your dog to spend hours chewing on the toy and enjoying the flavor of their favorite treat. The unique design of the KONG dog chew toy is what you would expect from a company that has a long history in making safe and friendly products for dogs. The ingenuity behind this and other KONG products is due in part to the love that the founder of the company, Joe Markham, developed as a faithful dog owner. This love has resulted in KONG only making high quality and safe dog chew toys. And for this reason, this product has received our bronze rating. 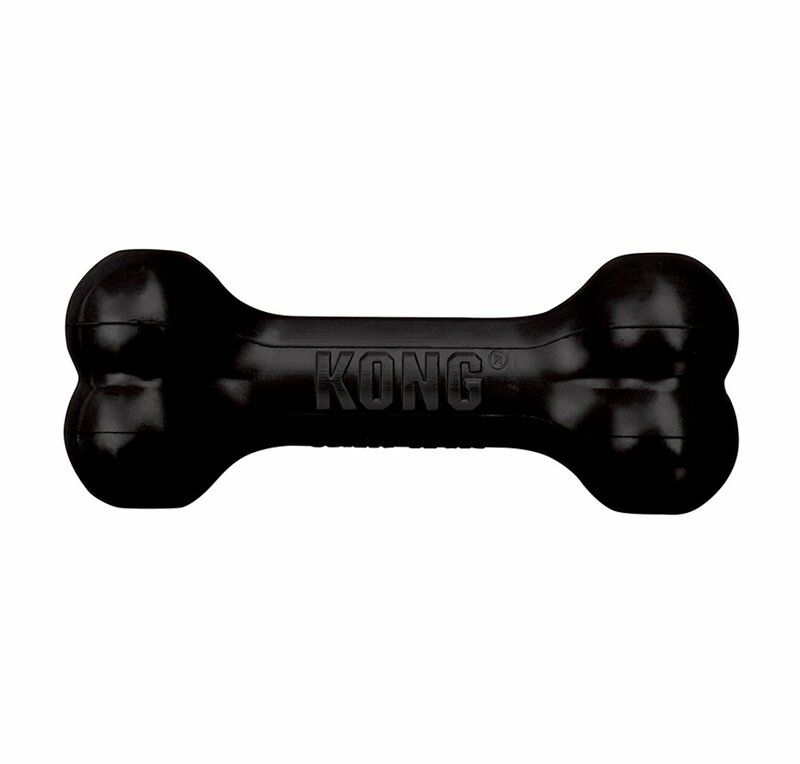 Since the KONG dog toy is made from a natural rubber, it bounces when it is thrown on the ground. This bouncy action on its own is going to be enough to get your dog’s attention. Add to the fact that the bouncing object has the smell and taste of their favorite treat,and it is understandable why pet owners say that once their dogs get a hold of the KONG chew toy, they never let it go. The chew toy is designed to keep dogs busy, especially in the hours that their owner is away. As your dog gnaws on the chew toy and as they fight attempting to get at the treat you have hidden inside, they are able to satisfy the urge that nature gives them to hunt. The bone itself is 7 inches long, 1.8 thick, and 2.5 inches wide. It weighs 8 ounces. These toys are designed to put up with any force or stress your dog puts on them. On Amazon, reviewers have said things like regardless of how much they throw the chew toy or how aggressively the dogs rip at the chew toy in an attempt to get to the treats that are held inside, the chew toy stands up. A nice thing about chew toys like these is that they give your dog a safe outlet for their natural desire to chew. This is something that we have mentioned multiple times in the review, but this is because the number one reason why dogs get put up for adoption is because the dog owner has a hard time with the pet constantly chewing on everything. Chew toys like these solve the problem. Here is a word of advice with any of the chew toys we have reviewed, including the KONG. If you see the chew toy starting to deteriorate or you see pieces of it laying around, it’s time to replace the chew toy. There are a few comments on Amazon made by pet owners who found themselves with an expensive veterinarian bill because their dog got a piece of a chew toy stuck in their intestine. However, this problem can be easily prevented by replacing the product when it gets to the end of its useful life. We selected the Playpaw Plush Squeaky Puppy Dog Chew Toy as our budget product because it is lightweight, fun to play with, and just plain cute. This is definitely not a chew toy that is designed for larger dogs. Instead, it is perfectly suited for small sized dogs and puppies. It has a cotton interior that surrounds the squeaky toy. While your dog is playing with it, he or she will be entertained by the noise that it makes. It will definitely keep your dog busy in the chewing department and hopefully distracted from chewing on your precious furniture. The toy itself is not that large. It is 8 inches long, with a 7 inch long wingspan, and it is around 3 inches thick. It weighs 1.6 ounces. It’s exterior is made from a superfine polyester fiber that has been dyed bright, attractive colors. This is a nice interactive toy that you as a dog owner can use to play tug-of-war with your small breed dog. Since it is lightweight, you can throw it far during an invigorating game of fetch. This is not a heavy chew toy like the KONG product we reviewed earlier. If that is what you’re looking for, you’re going to be disappointed. Many reviewers commented that their larger breed dogs were able to tear this toy to little bits in a matter of minutes. However, smaller breed dogs enjoyed playing with the product for months on end. When it comes dog chew toys, your dog’s safety should be your top priority. The last thing you want is for your dog to become injured because of a toy. Make sure that the chew toy is dog proof. This means that the toy should be designed for dogs and not contain ribbons, strings, and other parts that could easily tear off and harm your dog if they are ingested or are sharp. Chew toys that have a squeaker inside can be lots of fun for your dog when it is inside the toy, but your dog can get sick if he swallows a squeaker. The chew toy you purchase for your dog should be appropriate for the your dog’s size. Tiny chew toys can be easily destroyed and even ingested by big dogs. The last thing you want is for your dog to have a small ball or chew toy launched in his throat. Small dogs will not be able to get the benefits that come from playing with chew toys if the toy is too big. Of course, it is adorable to see a tiny Chihuahua with a huge toy. However, he won’t realistically be able to chew on it, and it won’t be much fun to play with. Think about how active your dog is when purchasing a chew toy. Does your dog prefer to drag the chew toy into his bed and gnaw away on it? Or would he prefer to play tug-of-war or fetch with you? Some chew toys are better suited for dogs that are much more active and constantly carry their chew toy around to be played with. Smaller, more fragile chew toys may be fine for dogs that only play a little with their chew toy and prefer to keep them all in their bed. Think about where your dog will primarily use his new toy. Will this chew toy be played with in the yard or dog park and possibly get wet and muddy? If so, choose one that will stand up to water and mud. You will not need something quite as durable if you will primarily play with your dog in your apartment living room. Depending on how long the chew toy is designed to last, you may need to clean the toys on a regular basis. You want to use water or a cleaning solution that is safe for dogs. Choosing a chew toy that will be easy to clean will keep your dog healthy and will keep your house free of mud and grit. Some chew toys are designed in a way where they can be thrown in the wash machine or others can be scrubbed in the kitchen sink. An easy to clean dog toy will kill bacteria and keep your pet and its living environment healthy. Dogs were made to hunt. They were made to run and exert lots of energy. When they are cooped up inside of a house for extended periods of time, they can start to get bored and frustrated. This will cause them begin to show certain behaviors that we as dog owners might not like. Directing a dog’s energy to play toys can resolve a whole host of problems. A good chew toy is interactive, it will distract them, it will have a good flavor, it will provide a puzzle to challenge dog, or as in the case of soft stuffed toys, it will provide comfort. Your dog is your best friend. If you take care of him, he will take care of you.